Gulab Jamuns are soft silky delicious golden brown milky balls soaked in rose (Gulab) flavoured sugar syrup. A classic traditional Indian sweet, Gulab Jamuns are famous all over the world, especially in South Asian regions. Traditionally, Gulab Jamuns are made with Khoya, and there are many versions of this wonderful sweet, prepared with Milk Powder and even Bread. From childhood, Gulab Jamuns were my weakness, and they still lure me even when I am resolved to say no to sweet treats! Just can’t resist that sweet golden temptation! Another favourite is my Sponge fruit trifle delight, which is something I am addicted to, diet or not. Well, there are somethings in life which are meant to enjoy and enjoy you must! Walk, exercise, detoxify and there you go, back in the track. 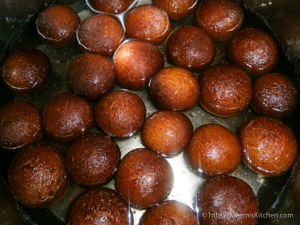 So, if you want to try hot Gulab Jamuns with Vanilla ice-cream or chilled juicy Gulab Jamuns, just indulge and enjoy! (Mmm.. what am I doing?? Now, I badly must get at least one Gulab Jamun from the fridge before continuing!). 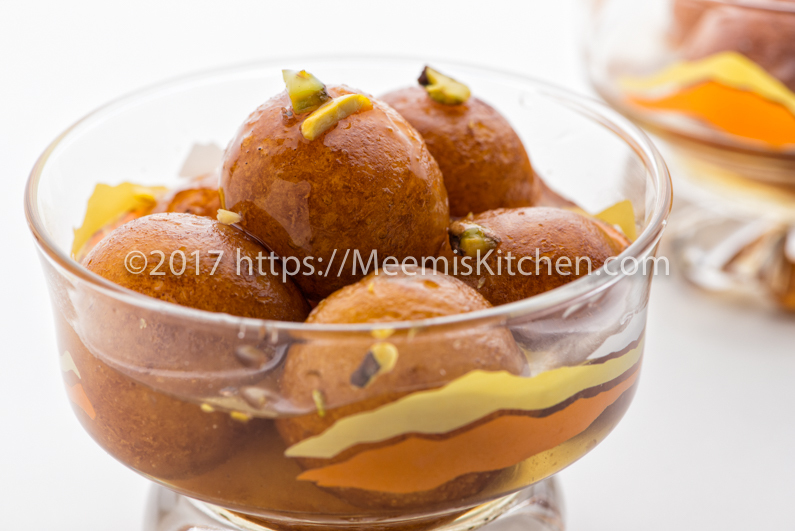 Homemade Gulab Jamuns with Milk powder and curd is really very easy to prepare. It will not take more than half an hour to prepare and even less time to vanish. I don’t like it too sweet, so I am careful while preparing the sugar syrup. Add some crushed pistachios while serving and you have the best dessert to end your celebrations. It is great for all special occasions, festivals or parties. Check my other dessert/ sweet recipes like Tender coconut pudding, Eggless Pineapple Pudding, Apple Biscuit Crunch, Chocolate Biscuit Pudding, Double Ka meetha or Bread Pudding, Parippu Payasam, Palada Payasam, Pumpkin Payasam, Sweet Potato Payasam and wonderful tea cakes and other baked treats. You will surely love these wonderful recipes like my family and friends. Without further ado, I present this wonderful recipe for golden juicy Gulab Jamuns! Cardamom : 2 – 3 nos. Mix together water and sugar and bring to boil. Boil this syrup for 5 minutes. Crush 2 – 3 cardamoms and add to the syrup. Add Saffron strands (optional) and rose water to the syrup, cover and keep aside. Seive together – Milk Powder (175 gms), Maida (75 gms), Baking Soda (1/4 tsp) and a small pinch of salt two times. 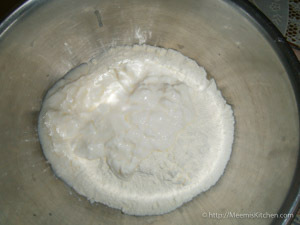 Add curd and mix well. 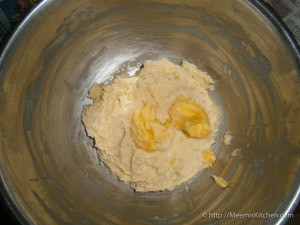 Do not knead too much; add butter (room temperature) and mix well to form a soft smooth dough. Make small balls and keep aside. 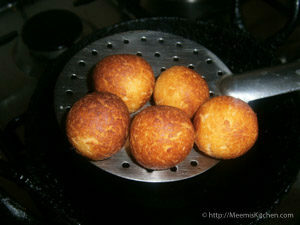 Heat oil or ghee in a kadai and fry the milky balls in batches, till golden brown on medium flame. Drain and transfer to the hot sugar syrup. The balls will soak the syrup and expand. Serve hot with vanilla ice-cream or serve chilled with crushed Pista or saffron. Enjoy! Sugar syrup is sweet enough, if you prefer sweeter Gulab Jamuns, add equal amount of sugar and water. Adding Rose water to the syrup gives it a unique flavor and fragrance. Do not boil the syrup for more than 5 minutes.The syrup should be medium sticky. Do not boil after adding Rose water. If your dough is too much sticky, add little flour and make a smooth dough. The oil/ ghee should be medium hot. 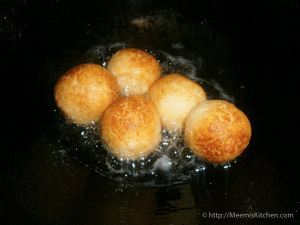 If the oil is too hot, the Gulab Jamuns will get burned and the inside part will not be cooked properly. The syrup should be hot while putting Jamuns. 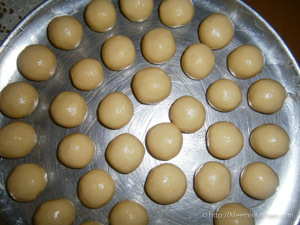 Hope you like this simple homemade Gulab Jamun recipe with Milk powder. Your feedback and comments would definitely encourage me. So, do put in your comments or share with your friends through the buttons on the side. God Bless!! yummyy!! which rose water is perfect? Once I used daber, I am not happy with it. Hi Nasreen. Thanks for your comment. Actually, I use a foreign brand from Bulgaria. I am not sure which brand is good here. I have seen Banjaras Rose water here. Not sure, how good it is. Maybe you get good edible Rose water from Baking ingredients shops.